SCRANTON – The University of Scranton offers a variety of meal plans, but not every student decides to rely on the school’s food outlets for their each and every meal. Scranton offers its student body eight different meal plans. First years and sophomores typically have the unlimited plans, while juniors and seniors usually choose from the reduced, less costly plans. Seniors, particularly, like to switch it up. Most like to have a meal plan, but a lot prefer to cook at home, too. 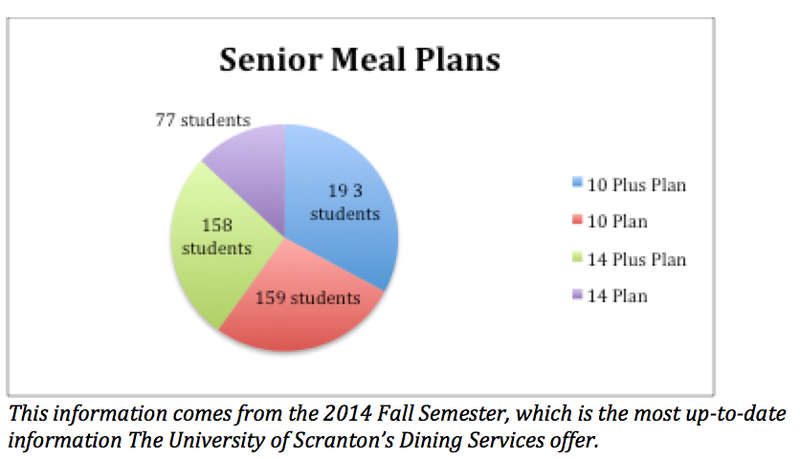 According to the Scranton Dining Service’s 2014 stat book, 516 of 945 (54%) seniors had meal plans in the fall semester. Most seniors (33%) chose the 10 plus plan, while the 10 plan and 14 plus plan weren’t far behind at 27% each. The least chosen was the standard 14 plan (13%). The plus added to the two plans simply indicates an addition to students’ flex money, which has no impact on how many meal swipes a student is allowed per week. Resident District Manager Ted Zayac said seniors usually choose the plans with more flex because it gives them more options and freedom when choosing what to eat. Scranton offers meals in exchange for flex or royal at Hyland Café or Bleeker Street. Zayac said regardless of where students live, they usually choose their plans based on what fits their needs and desires. Zayac, who said the numbers from the 2014 Scranton Dining Services page are similar (not yet official) this year, believes that it’s probably cheaper on paper to cook at home, but outside factors play a big cost. For seniors at the University, purchasing a meal plan seems to be the most logical and convenient option. Some, though, prefer cooking in the comfort of their own kitchen, whether they live on or off campus. Alex Defuria, a senior at the University who lives off campus, has the 10 plus plan. He said the 10 meals are convenient, and he likes having other options. Other seniors, like on campus student Mary Kate Kotchick, prefer to cook on her own without any meal plan. She said being able to control her every meal helps her stay on track with her diet.